The Cambria range of innovative bathroom sanitary ware, features curves and modern soft square design has been manufactured from high grade ceramic with a fabulous white gloss finish. The luxury Cambria contemporary bathroom suite includes a close coupled toilet, a double ended freestanding double ended bath with waste and a 1 tap hole basin with full pedestal. 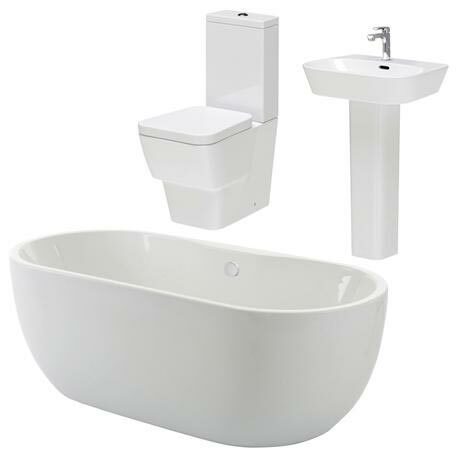 The Cambria sanitary ware has been manufactured from high grade ceramic with a fabulous white gloss finish, characterised by its modern soft square design and curves. The Luxury modern double ended curved free-standing bath - made from smooth white gloss acrylic, comes with a high-quality modern easy clean click clack bath waste with overflow, controlled by a simple push button mechanism for that finishing touch in your bathroom and provides excellent performance. The click clack waste is removable for cleaning purposes. Tap mounting holes to be drilled to suit by installer.